281 kilometers south of Bangkok, Hua Hin, which literally means stone head in Thai, is the oldest beach resort of the country and is still very popular. Clean white sand, crystal clear water and a tranquil atmosphere has continued to attract tourists in search of peaceful and relaxing holidays. The town was originally known as Ban Samoe Rieng, or Ban Laem Hin (Stony Point Village). The construction of a railway station in the city as part of the Southern Railroad in the reign of King Rama VI resulted in making Hua Hin stand out from many quite fishing villages. In addition, the construction of a Summer Palace of King Rama VII totally transformed the village into a high-society resort town for royalty. Even today, the Royal Family continues to reside at the Palace for part of the year. Hua Hin’s consequence came with the opening of the Railway Hotel (known today as the Sofitel Central Hotel), an elegant Victorian-style resort hotel, and also the countrys first standard golf course. A cluster of royal and high-society residences gradually became more visible resulting in the transformation of the whole village into the first seaside resort of the country, where visitors could enjoy swimming, fishing, and golfing in the country’s first standard golf course. Nestled in the tropical zone off the west coast of the southern part of Thailand in the Andaman Sea and the Indian Ocean, the province covers an area of approximately 543 square kilometers (excluding small islets). It is estimated that Phuket Province covers an area of approximately 590 square kilometers if its 39 other small islands are included. The islands total length, from north to south, is estimated at 48.7 kilometers and approximately 21.3 kilometers wide. Staying on the island is easy, as there are only two seasons in a year - the rainy season (May to October) and the hot season (November to April). The low season of phuket is between September and October as they are the wettest months. The best period for a visit, is from November to February, when it is possible to see the clear blue sky, feel the fresh sea breeze and marvel at the crystal clear water while lying on powdery, palm-fringed beaches. Average temperatures ranges between 23°C and 33°C. Kalim Beach:Located north of Patong Beach is a secluded beach dotted with rocks and coral reefs. Accommodations and restaurants are available. Another interesting stopover is Freedom Beach which is located around the head of Laem Ka Sai Rot and is accessible by a chartered long tailed boat. Kamala Beach: Located approximately 26 kilometers from Phuket City, Hat Kamala is a relatively secluded 2-kilometer beach that is suitable for total relaxation. Accommodations are available. Patong Beach:This Beach is the most developed, most vibrant, most visited beach of Phuket that never fails to impress visitors. Located approximately 15 kilometers from the city, the beach has a wide range of accommodations and shopping arcades, and provides magnificent leisure activities and energetic night-time entertainment. It is a picture perfect postcard view of a 3-kilometer long white sandy beach that is perfect for swimming, lazing, and enjoying challenging water sports such as jet skiing, windsurfing snorkeling, sailing, and parasailing. Ao Chalong:This bay, which has the islands largest and most visited pier, is located 11 kilometers south of town. From this pier, holidaymakers can get chartered boats to some nearby islands south of Phuket. The bay area is dotted with dive shops, a few travel agencies and superb seafood restaurants. Although the bay has a stunning setting and relaxing ambience, swimming is not recommended here. Ao Sen:This is a small bay located next to Hat Nai Han, near the Phuket Yacht Club, which has a peaceful and scenic beach with white powdery sand. Karon Beach:Located south of Patong Beach, Hat Karon is a curving beach that lies beautifully in the sun with small sand dunes, casuarinas and palm trees. The crescent bay is the beach's signature that drawing travelers attention. From May to October, the beach may be affected by serious undertows, as the bay open. Watch out for those warning flags before going swimming or surfing at the southern end of the beach. During the high season, the beach is ideal for relaxation, swimming or sunbathing. A wide range of accommodations, from top-end to budget and mid-range, are available. Other facilities such as nightclubs, restaurants and other evening entertainment are located along the beachfront road. The beach is located approximately 20 kilometers from the town and can be reached by taking either s or buses from Ranong Market in Phuket City. Transportation is available from 7.00 a.m. to 5.00 p.m. and costs approximately 20 baht / person / trip. Taking a taxi to the town is another option. It costs approximately 200 baht to Phuket City and 150 baht to Patong Beach. Kata Beach:Located approximately 17 kilometers from Phuket City are Kata Noi (Small Kata) and Kata Yai (Big Kata) Beaches. Both are renowned for snorkeling to see the coral, tropical fishes and the seas eco-system. Also worth visiting is Ko Pu, a small uninhabited island located off Laem Sai. Most visitors find snorkeling along the islands rich coral reef enjoyable. Diverse beach activities are available on both beaches. Accommodations on Hat Kata are set amidst tropical and cliff settings. Visitors can choose to stay in budget to top end accommodations according to their preference. Hat Nai Han:Located a few kilometers from Kata Beach, next to Phromthep Cape, approximately 18 kilometers from town is Hat Nai Han, an extra-ordinary beach that has white powdery sand and crystal clear water. The beach borders on two charming landscaped lagoons surrounded by rubber trees and other tropical plants. As the beach has not yet been fully developed to its full potential, it is less crowded, more peaceful, thus is ideal for people seeking solitude. Holidaymakers are not recommended to swim during the monsoon season from May to October. Watch out for the red flag! Hat Rawai:Located approximately 17 kilometers from town is the less crowded, more peaceful and less commercial beach with a second-to-none pristine beach. The Beach is home to a well-established community of Phuket s Chao Le people (sea gypsies). In addition, from this beach visitors can charter boats to explore other offshore islands. Hat Laem Kha, located to the northeast of the beach, is the departure point for those wishing to visit Ko Lon, and Ko He. Laem Phromthep, Phukets landmark, is located at the southern end of the beach. This cape is an ideal spot for diving and snorkeling. Accommodations range from budget bungalows to middle range resorts. Phromthep Cape:Literally translate as Brahmas Cape, Laem Phromthep is perhaps one of Phuket's most important landmarks. There is a saying that you havent been to Phuket unless you visit Laem Phromthep. It is here that visitors soak up the sun and savor the breathtaking panoramic view of the Andaman Sea from the islands southern-most tip. The Cape is crowded especially in the evening, as it is a popular observation point at sunset. Laem Phromthep is located approximately 2 kilometers from Rawai Beach. The viewpoint:The most famous observation point of the 3 beaches, Kata Not, Kata and Karon, is located on the road half-way between Nai Harn Beach and Kata Noi Beach. From this spot, an intriguing view of the 3 beaches and Ko Pu has constantly impresses visitors. Ao Bang Tao:A large open bay that is the location of one of Phuket's longest beaches, Ao Bang Thao has a long history related to the economy of the island. Previously a tin mining area the location has been transformed into an area where Phuket's luxurious resorts and golf courses, especially Laguna complex, are located. Additional accommodations outside Laguna at the bays south end are also available. Phuket City and old Buildings:Phuket City is a fascinating city that can be explored on foot or by traditional means of transportation, tuk-tuk or Sino-Portuguese architecture that is evident in the citys shop houses provides the town with a charming atmosphere and a late 19th century ambience. For visitors interested in strolling along the city, start the trip at the central post office and walk west along Thalang Road, then turn south at the Standard Chartered Bank building and walk towards Yaowarat Road. Continue the trip to Fountain Circle, then head west to Ranong Road and proceed to Patipat Road, which connects with the historic Krabi Road. Covering an area of 191 square kilometers, Ko Pha-ngan is located 20 kilometers directly north of Ko Samui, or approximately 100 kilometers from Surat. The best time to visit Ko Pha-ngan is from February to September. Interesting attractions include secluded and virgin beaches around the island, a hilltop temple called Wat Khao Tham which is ideal for meditation, Than Sadet Waterfall, and the Namtok Phaeng National Park. Renting a motorcycle to explore the island is recommended as there is a lot to see and do. A small isolated island situated 45 kilometers to the north of Ko Pha-ngan, Ko Tao was once used as a prison for instigators of the Bavordet coup. The island is famous for its rich sea coral reefs and inhabitants and secluded beaches set in a laid-back atmosphere. Ideal for snorkeling and diving, there are numerous diving schools scattered around the island that have always attracted diving students. With exceptional underwater visibility, Ko Tao is one of Thailand's finest offshore diving spots with main attractions such as White Rock, Shark Island, Chumphon Pinnacle, Green Rock, Sail Rock and Southwest Pinnacles. The stunning viewing point is a spot where visitors can see three connecting beaches stretching beautifully to the horizon. Apart from Ko Pha-ngan, Ko Tao can be reached either from Surat Thani or Chumphon Provinces. Accommodations in the form of bungalows, at various price ranges, are available. The best time to visit Ko Tao is from February to April. Traveling on the island is possible by boat, car or motorcycle. Phetchaburi, locally known by Thais as Muang Phetch, is located 160 kilometers south of Bangkok. One of Thailands central region provinces, Phetchaburi is situated on the western shore of the Gulf of Thailand with an overall area of approximately 6,225 square kilometers. Its terrains throughout the western border, where Tanaosri Range lies as a natural border between Thailand and Myanmar, are mountainous dense jungles. In the east, there is an 80- kilometer long coastline towards the Gulf of Thailand. Ko Surin Nuea has several bays. The most well-known bay is Ao Mae Yai, the largest bay that offers calm waters. To the southeast of Ko Surin Nuea lies Ao Luek, which is so deep that the sea appears dark green, offering splendid shallow corals as well as sea weeds, sea flowers, coral lines, and various species of fish. Sea Gypsy Village, a Singha, or Morgan, Sea Gypsy tribe resides on the shore of Hat Sai En, Ko Surin Nuea. There are 130-150 sea gypsies who still hold on to their traditional ways of life and still live in their boats. On shore, there is a wooden sculpture resembling the Indian Totem Pole and is considered a sacred area. Every year, on the 15th day of the waxing moon in April, the sea gypsies in this village would worship their respected spirits. The event lasts for 3 days. Ao Mai Ngam, situated to the west of Ko Surin Nuea with the National Parks office nearby. There is a 2-kilometre walking path that you can take to enjoy the natural features of Hat Mai Ngam or you can take a longboat ride. The lovely bay provides fresh water and a long beach that is best for snorkelling and swimming. Ao Chak, situated to the north of Ko Surin Nuea.The bay possesses unspoilt coral reefs. Interesting attractions on Ko Surin Tai include Ao Tao, situated to the east of the island. The bay is home to numerous sea turtles and magnificent coral reefs. Ao Phakkat, situated to the south of Ko Surin Tai. It is where unspoilt coral reefs can be seen. Similan is a Yawi or Malay word, which means nine or a group of nine islands. This is located in Tambon Ko Phra Thong, Amphoe Khura Buri, occupying an area of 32,000 acres. It was declared a national park on 1st September 1982. Similan is a small group of islands comprising nine islands stretching from north to south, respectively, namely: Ko Bon, Ko Bayu, Ko Similan, Ko Payu, Ko Miang (two adjoining islands), Ko Payan, Ko Payang, and Ko Huyong. The National Parks office is located on Ko Miang. Similan is highly praised for its beautiful scenery, both onshore and underwater. It is situated 70 kilometres from Phang-nga town. Best time to visit is between November and April. Ko Ba-Ngu:is the ninth island of the Similan group of islands. It has a strange feature. Looking from one point, the shape of a skull can be seen. Underwater is as beautiful as a valley full of coral reefs, deep gorge, and various sizes of fish. Ko Huyong:the island offers the whitest and longest beach of all the nine islands. During turtles' egg laying season, from November to February, there would be tracks on the beach from turtles that come onshore to lay eggs, resembling centipede tracks. Ko Miang:is the second largest island among 9 islands after Similan Island. It is where the office of the National Park is located. The island offers a scenic beach which is suitable for camping. There are several diving spots that suit both snorkelling and scuba diving. The famous scuba diving spots including rock formations that lie to the west of Ko Tachai where whale sharks can be seen, Ko Bon, Christmas Point rock formation, Fantasy rock formation, and Ao Kwang En (to the east of Ko Paet), etc. Snorkelling spots are scattered around these nine islands. The interesting points are by the sailing boat rock, Ao Kwang En, and behind Miang Island. Phi Phi Islands are located just 40 kilometers away from both Krabi and Phuket. Thus, despite the fact that both Noppharat Thara Beach and Phi Phi administratively are a part of Krabi Province, most tourists think that Ko Phi Phi is part of Phuket Province. The islands and the coastal hills are composed mainly of limestone and are an extension of the limestone mountain range in Phang-Nga Province. The main characteristics of these mountains and islands are their steep cliffs, large caves and dwarf trees growing out of the rock crevices, like those in Phang-Nga Bay. The island group is composed of two rocky, tree-covered islets Phi Phi Don and Phi Phi Le. Phi Phi Don, the larger islet to the north, is well known for its fine beaches and coral formations. Above average tourist facilities and accommodations are available along two beautiful curved bays, namely Ton Sai Bay and Lodalam Bay. Several shops at Ton Sai can arrange diving and snorkeling trips around the island or the nearby islands - Ko Phi Phi Le, Ko Yung and Ko Mai Phai. About 2 kilometers to the south is Phi Phi Le. Contrary to Phi Phi Don, this islet is uninhabited as there is no beach area as the island descends abruptly into the sea on all sides and it is prohibited by the administrative body. The main attraction is a large cave about 3.2 square kilometers in size known as Viking Cave derived from one of the numerous drawings on the wall which resembles a Viking ship. The cave has a 10 to 15-metre high ceiling which contains many ledges inhabited by thousands of swallows, thus a bird's nest collection demonstration is a regular feature of guided tours. Ao Maya and Ao Lo Sama - Phi Phi Islands scenic coves are favorite snorkeling places while the sea around the islands, especially the southern part, which are deep and full of coral formations are popular diving spots. With its emerald crystal sea, secluded beaches, mountain cliffs, colorful coral reefs and undersea life, Phi Phi is a paradise in the Andaman Sea. The best time to visit Phi Phi Islands is from November to April, when the sea is calm. Ko Yung, an island to the north of Ko Phi Phi Don, has a stone beach on the east and small sandy beaches amid valleys. 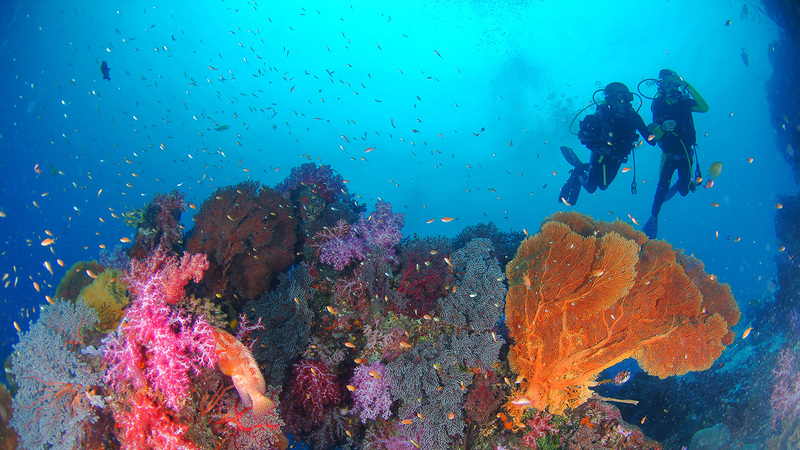 In addition, the island is teeming with diverse colorful coral reefs. Ko Phai, another island to the north of Ko Phi Phi Don and not far from Ko Yung, has spectacular beaches in the north and east of the island. The bank of coral reefs comprised mainly of antler corals stretches from the north to the south of the island. Ko Lanta consists of two adjacent islands: Ko Lanta Yai and Ko Lanta Noi. Koh Lanta Yai, This island is home to "Chao Le" or sea gypsies who continue to maintain their traditional lifestyle and beliefs, such as setting a boat a drift to drive out evil and bring good luck, which is practiced during the full moon in June and November. In addition, the island provides tourist facilities while Ko Lanta Noi is the location of the district office. Most of the beaches on Ko Lanta Yai such as Kho Kwang, Khlong Dao, Phra Ae, Khlong Khong, Khlong Nin and Ba Kan Tiang lies in the west, can be reached by road and offer a wide range of accommodations. Ko Lanta National Park: Covering an area of 152 square kilometers, the Park is comprised of many different-sized islands, some of which are surrounded by beautiful coral reefs such as Ko Ha, Ko Rok and Ko Hai. The Parks main island is Ko Lanta Yai, where both the Headquarters and National Park Office are located. The island itself is generally rugged and mountainous with gravelly and sandy beaches to the south. The most suitable time to visit Ko Lanta is from November to April.